Office opinion of this CPU cooler is quite distinctly polarised between 'very cool' and 'a camp as a boy-scout's outing'. There's no denying, however, that if you pack one of these into your rig, it'll be the kind of thing that will draw a crowd at a LAN party. 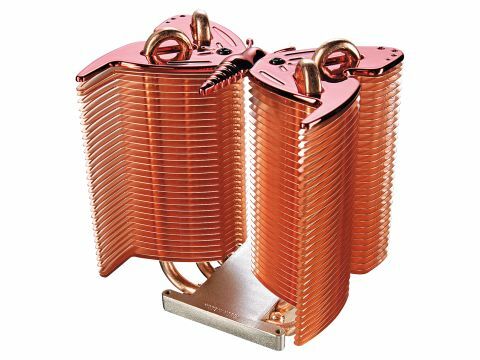 You won't want to use it on a hot, overclocked chip however, as it's an entirely passive cooler, and has no fan mountings for enhanced heat dissipation. This puts it quite squarely in the silent PC department, as that's its real strength. We've run hot CPUs under passive coolers before, and the results are never pretty; simply put, you need some active cooling for a fast-running CPU. That said, with adequate air movement in your chassis, the Zerotherm does the job nicely. And lets just remember how it looks: distinctive. If you're running a Core 2 Duo or Athlon 64/AM2 at stock speeds with a well-cooled case, this would make an attractive PC upgrade.